Tom King’s broad strokes approach to the Dark Knight has been one of the best parts of his run on Batman. He adheres to the spirit if not the letter of the canon and has managed to finally bring Batman and Catwoman together in a realistic, satisfying way. The Annual is simply divine. Comic book time is a fickle mistress. Days, weeks, or months can pass in the breadth of an issue, or barely half an hour. It all depends on pacing in the story you’re telling. Here, in Some of These Days, we’re treated to this version of the Bat and the Cat’s entire life together. It does not disappoint. From the beginning (when she steals the Batmobile), there’s a flirtatious courtship at play. The Cat leaves a mouse for the Bat to find. It’s kind of adorable. Batman isn’t even annoyed about the theft of his beloved car, nor of how his quarry quite literally vanished. 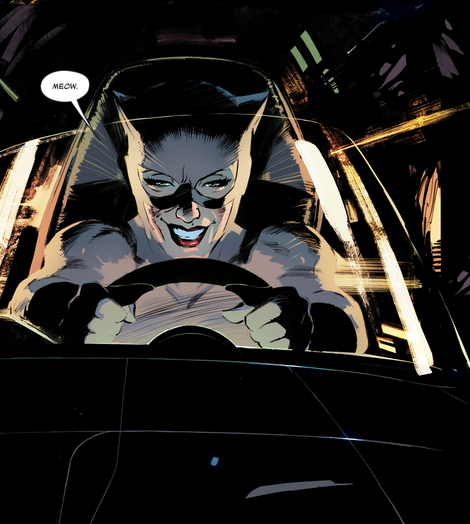 It’s evident that she knows his identity from early on— something different from how things have played out in other comic timelines, but again, Tom King plays fast and loose. The next time, Catwoman shows up at Wayne Manor to steal a pen. She continues to tug at the strings of Bruce Wayne. She knows he’s Batman, and she knows he won’t leap out the window after her when there’s a parking lot full of cops outside. Lee Weeks’ work as illustrator here is just gorgeous. Elegant, simple, not overdone. Elizabeth Breitweiser’s understated color is a beautiful accompaniment. King has captured these characters beautifully. Every word out of their mouths sounds real and true. I’ve thoroughly enjoyed the series under his tenure, and the Annual is no different. Other artists pick up the last quarter of the comic, but to share more of their story would spoil the ending. I’m not going to do that. I’ll just say that if you only buy one comic this Wednesday it should really, really be this one.